Have you ever wished to hear the gras growing, or listen to the sound of a flowering snowdrop or Daffodil? Unfortunately, plants seem to be our more quiet companions. On this page however, it is shown how this became reality. See and listen! Plants are living organisms. Growth is a highly active process mediated by the transport of water and electrolytes. Thereby, electrical potential shifts are generated which can be measured with electrodes attached to the stem, to leaves or blossoms. Biologists have discovered, that plants produce so called action potentials travelling along the stem - similar to humans neuronal potentials but much slower. 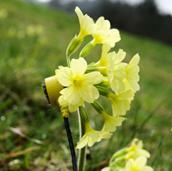 They found those signals to be associated with the control of flowering. For the production of this music, the electrical signal changes of various plants and flowers have been measured. These signals were used to play various electronic instruments. Each sound we hear is initiated by the electrical signals of a plant meaning that this music is composed by plants. It is produced by a sonification tool that was originally programmed for sonification of neuronal signals from the human brain. Here, it is used as a plant-computer musical interface. Sensing the spirit of plants can be an uplifting experience! 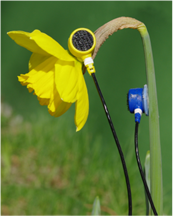 Electrodes are attached to a Daffodil record their electrical signals which we convert into music.